A chocolate chip slides into the cake’s crevasse. Such a fate! We’re here, friends! At the end of the squash vine. It’s been an interesting trip. It’s been sweet. It’s been savory. There’s been heartbreak and 71 Chips Ahoy! cookies. Thanks for sticking it out with me. I’ve saved my favorite zucchini recipe for last. 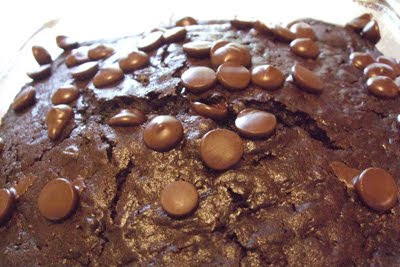 A year ago, I was testing chocolate zucchini cake recipes to find my favorite. 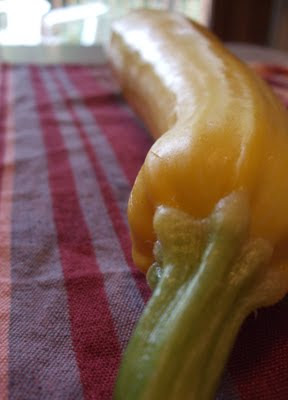 Last year, like this year, I had a bumper crop of summer squash, and I was desperate to use it up. I made this chocolate zucchini cake from Simply Recipes a bunch of times. Its orange zest, bundt shape, and walnuts had me over the moon. It was moist, and it used up two cups of squash at a crack. Case closed. Then I baked this recipe from King Arthur Flour, and I’ve never looked back. 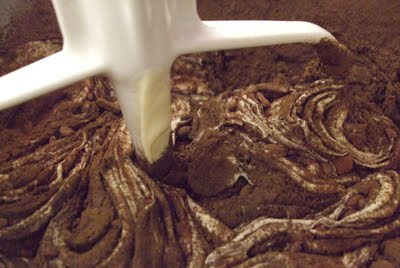 Cocoa powder and espresso powder are stirred into the batter. The KAF recipe also calls for two cups of shredded zucchini (OK, I’m listening). But then there are chocolate chips in the cake (tell me more) and on top of the cake (double chips, eh?). Erin likey. It was the espresso powder, though, that really did me in. It amplifies the chocolate with its smoky, bitter flavor. Consequently, the cake is not cloyingly sweet, like a grocery store chocolate cupcake. Espresso is like a complementary color to chocolate. It makes the chocolate glow a littler brighter, hum a little louder. 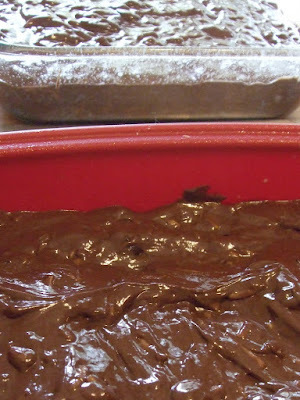 Add a touch of espresso or coffee (powder or liquid) to the next chocolate thing you bake. The chocolate flavor will be more intense, but not sweeter. I used Ghiradelli bittersweet chocolate chips. They’re my standard chip. I love the matte browns of the cocoa powder and espresso powder. And boy, did that smell good. The KAF cake also is more moist than my ex-favorite cake, and because of that, I think the squash is less prominent. Eaters tell me that they never would have known there was squash in the cake had I not advertised it. Thanks again for reading my zucchini diary. I hope you were inspired to seize the squash (not a euphemism) and explore its myriad applications. Let me know what you made with your zucchini! I didn’t bother weighing this squash before I shredded it for the cake. I wanted to use it all up! Heat oven to 325 degrees Fahrenheit. Grease a 9-by-13-inch pan. Add a little flour, add a little yogurt. And so it goes till both are completely added. 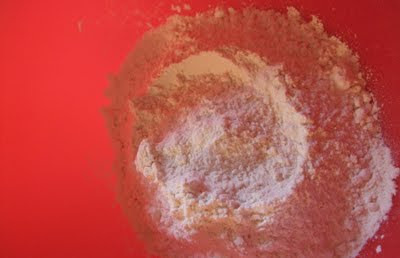 Stir in yogurt alternately with the flour. Don’t forget to scrape down the sides of the bowl from time to time. Add cocoa and espresso powder. Mix until smooth. 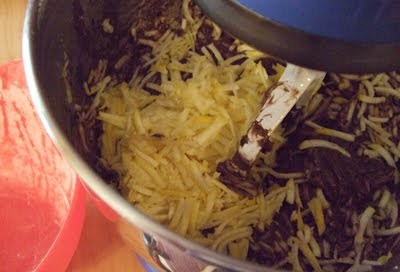 Fold in squash and 1/2 cup chocolate chips. Yes, it’s a lot of squash, but it disappears into this moist cake. Pour batter into prepared pan, and bake for 35 minutes. (I find that this cake is long baking.) Take the cake from the oven when the top springs back when lightly touched. 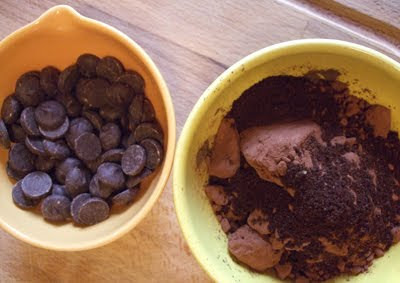 Sprinkle the cake evenly with 1 cup of chocolate chips and return it to the oven for 5 minutes. Remove cake from the oven and allow it to cool before serving. Like so many chocolate baked treats, this cake is better on the second day. Let it sit overnight at room temperature. I split the cake batter into two pans. One cake for VHHQ, one cake for work. Hey, I didn't see this cake at work!! This will be made at some cake-y point in my life. Delish!